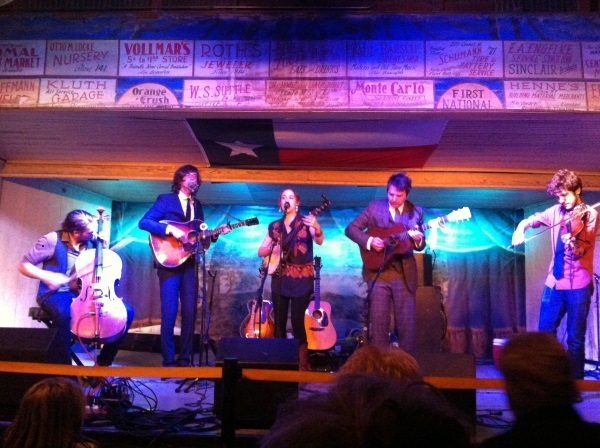 To those who have not seen a show at Gruene Hall, it is not hard to describe the feel of the place. It is the oldest continuously run dance hall in Texas where people have gathered to hear music played in close quarters since the Hayes administration. It opened in 1878, to be precise, if your political history is a little rusty. The building itself is a ramshackle affair with a plain white shiplap front and screen windows running the length of both sides under the low slung eaves of the corrugated tin roof. The life inside not only goes out; the sounds of night and kids running around in the courtyard come in. Inside, every inch of woodwork shows the patina of age and use, nowhere more so than the dance floor, whose boards shine slick from the countless boots that have slid across them over the years. Imagine an enormous screened-in porch on a 19th century farm house with a bar, a stage, and pool tables and you’ve got the picture. What is harder to describe is the experience of seeing a show there. In the last ten years, I have seen many. Each was unique, yet each uniquely Gruene Hall. It’s where I saw I Leon Russell limp from the bar up front to the stage in the back through the corridored crowd like a broken prize fighter before assuming his place on the keys and setting the room on fire. It’s where I discovered I am a Robert Cray fan when a friend from Japan made me take him and I ended up enduring two hours of shoulder rubbing with an obnoxiously drunk, air guitar playing, forty something ’80s frat guy in order to see the neatly pressed axe man from five feet away do things on a Stratocaster that still haunt me. The incongruity of seeing the force and control of such immense talent in such an uncontrived, uncontrolled environment cannot be conveyed with language, for how can I explain that the creak of the ladies’ bathroom door at immediate stage left did not distract from the delicate perfection of a Milk Carton’s Kids performance, but somehow added to it? Perhaps Joey Ryan of the MkC said it best as we stood at the bar ordering a Shiner Bock for him and a Lone Star for me. Looking around and taking in the sight he said, “It’s what I thought Texas would feel like.” “Welcome to the lion’s den,” I replied.